“Johnston’s remit was to unite the London Underground Group, the different companies all using the same rails and tunnels,” says Donna Steel, curator of a new exhibition about Edward Johnston and his influence on printing at the Ditchling Museum of Arts and Crafts in East Sussex to BBC. “All the advertising, all the signage was all completely different - there was this cacophony of letters. Johnston applied the proportions of Roman capital letters to his typeface, so it was rooted in history, rooted in traditional calligraphy. But it has an elegance and a simplicity that absolutely fitted the modern age” she continues. Hand drawn by Johnston whilst living in Ditchling this alphabet is gloriously simple, but its design is rooted in much earlier lettering since it bears the proportions of Roman capitals. The design was initially proposed in 1913 by Frank Pick, commercial manager of London Underground Railway as a joint project for Edward Johnston and Eric Gill. Yet Gill was unable to proceed since he had agreed to a major commission of Stations of the Cross stone reliefs for Westminster Cathedral. Born in Uruguay, this exhibition shows Johnston as a true man of letters, resurrecting and redefining calligraphy in the West, and designing an elegant typeface for London Underground. Highlights include Johnston’s calligraphy for W R Lethaby which secured his post as a teacher at Central School of Arts & Crafts; manuscripts showing his development as a calligrapher; rarely seen working drawings of the Underground typeface, and original drawings for Gill Sans. An “authentic lettering of the 20th century” the typeface aimed for nothing more than consistency and clarity. “Ever the purist, Johnston went back to his calligraphy roots and simplified the Roman letters down to their very essence, distilling along the way a visual identity that endures today. (The font was only updated once, and ever so slightly, in 1979)” writes Rogers. Yet this is just one of the many celebration Ditchling Museum of Arts and Crafts has organised for this a summer that is dedicated to Johnston. The museum has created a giant and unorthodox method of printing Johnston Sans - a 12.5 ton steamroller according to the BBC’s Dan Damon report. 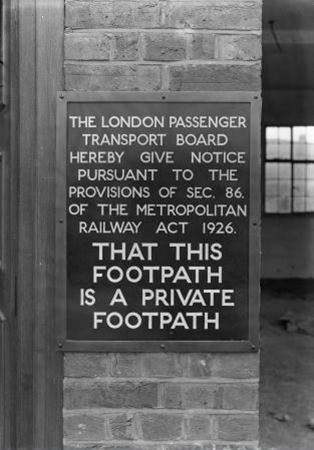 A century ago this iconic typeface was created and it is as contemporary as London. This is British typography at it’s best.